Your Saltillo repaired and restored to its full beauty! If your Saltillo is stained with a build-up of old, yellowed topical treatments, has lost its bright, like-new luster, and is generally feeling a little depressed about its appearance, Stone Surface Specialists will restore your Saltillo surface to its former glory. We will gently and skillfully deep clean it, polishing all its cares away and seal it with the most Saltillo-friendly sealers known to man. If your Saltillo was never sealed or if the sealer has worn away, normal household cleaning won’t be able to reach dirt trapped in its delicate and porous surface. Inferior wax sealants can darken and discolor over time, and eventually begin to scratch and flake off, leaving your Saltillo looking rather sorry for itself. 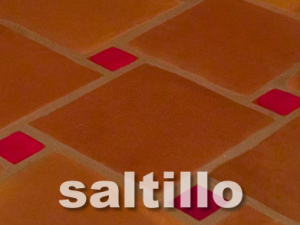 Saltillo tile is delicate and sensitive. Our expert technicians know just what methods and treatments to use to clean and protect it from future damage. Call us today to schedule your FREE inspection and estimate with one of our experts!